Are cherries or grapes considered a berry? seriously…is any1 else getting hungry from seeing all these food pics? I’m pretty sure those green ones at the top right corner aren’t grapes… they look like em though. Anyone ever put grapes in the freezer? They’re friggin’ delicious that way. Amazing on a hot summer day. The green ones are gooseberries, and the red ones are red currants. Putting grapes in the microwave is far more interesting, if not as refreshing. The cherry is some sort of special kind of fruit because of it’s cherrystone. I’m not sure about grapes. I think they’re just fruits. Either way, fruit, berries, berrylike fruits, fruitlike berries and in between, all make kickass smoothies. 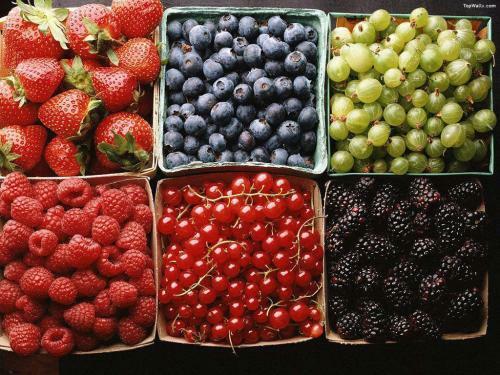 I thought berries had many seeds typically on the outside of the fruit, or nested together… so strawberries and raspberries are berries, where grapes are a fruit from a vine. Cherries are related to peaches and apricots which are oddly enough related to roses. I don’t think blueberries are actually berries. And bananas are herbs, and apparently will die out due to inbreeding. Something’s weird about that number, lemme check my sources. That number includes all the spam comments that were submitted back in the day when MCS was a wild wild west type blog and permitted anyone to comment without registration. From the stats page, it looks like there have been 32,633 comments so far.